Your loved one’s obituary is a tribute to him or her, describing achievements, recognizing family and sharing facts about the life of that special person that you love so much. When you have a well written obituary that you want to remember as much as you do your loved one, including the write-up in your funeral programs is a lovely idea, and an obituary template makes it easy to do just that. Obituary templates are text boxes that are pre-formatted and ready to display an obituary. 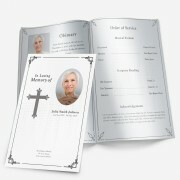 Many of our funeral programs include a template for obituary write-ups in their designs. The template features a standard obituary format, so even if you don’t have one already written, you can use it as inspiration to compose one of your own. 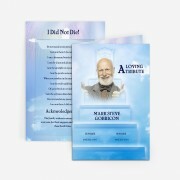 Some of the obituary templates even have spaces where you can add one or more photographs to the obituary format, making the write-up extra special. When you purchase a funeral program that includes an obituary template from Funeral Pamphlets, you’ll receive an obituary template for Microsoft Word. The template is very easy to edit with the program. Don’t have Microsoft Word already? Not to worry! Each of our funeral program sales pages has a link that you can follow to download a free trial of Microsoft Word for your computer. If you need help customizing your obituary template download, we’re here to assist you. We can provide support via phone or email to help you get the obituary template completed if you run into any trouble; however, most people find that they’re able to insert the text they desire with no trouble at all, even if they don’t have any experience using Microsoft Word. We also offer customization service and can handle adding the text to the obituary template and the rest of your funeral program. Once we’ve made the changes, you’ll receive a completed obituary template download with a full funeral program via email. Not sure exactly what a funeral program is? Basically, a funeral program is a final keepsake that commemorates the life of a person who has passed away. In addition to an obituary template, our funeral programs usually feature an order of service that lets people at the memorial service know the order of events that will take place. Funeral programs often include quotes, poems, scriptures and acknowledgements, and we have many different kinds available that include a template for obituary write-ups here at Funeral Pamphlets. Some people refer to funeral programs as obituary programs. The terms can be used interchangeably, so any of the funeral program downloads that you find here at Funeral Pamphlets can be used as obituary program downloads. You receive access to your downloadable obituary program template for Microsoft Word immediately after checkout, so you can get started right away. 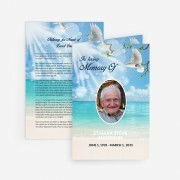 Browse our selection of funeral program templates with obituary templates now and find the design that reminds you most of your loved one. We’ll be glad to assist you with finding the right obituary program template. Just contact us for help.